Kieran Dunbar and former Brake Courtney Baker-Richardson are on hand to help launch the new partnership between Moreton Morrell College and Brakes. Warwickshire College Group and Leamington Football Club have announced an exciting new partnership and football academy to be based at the group’s Moreton Morrell College from September with the team playing at Leamington FC’s Phillips 66 Community Stadium. The association will see academy students study full-time for two years to gain a BTEC qualification (Level 3) in Sport while getting additional coaching and exposure to semi-professional football. The course offers ten hours a week of professional coaching, fitness training, nutritional advice, strength and conditioning and the opportunity to play competitive games in the National League Under-19 Alliance. This provides a potential pathway for students to progress their football career at Brakes. The coaching staff are led by former Coventry City and Wales international and UEFA A licensed coach David Phillips, who has worked for the college for 15 years. The academy is also supported by Hednesford Town centre-back Samuel Oji. Neil Coker, group vice-principal curriculum at the Warwickshire College Group, WCG, said: “We are extremely excited about this new partnership with Leamington FC which builds on our already strong reputation for sport at Moreton Morrell. “The new Football Academy is part of our long-term plan to further develop Moreton Morrell as a national centre for excellence in sport. 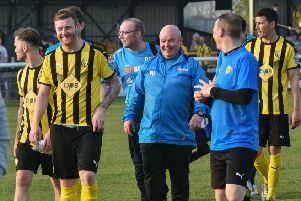 “The partnership with Leamington FC will present young footballers with a very real opportunity to learn and train with top-class coaches and will give many an excellent platform to launch a career in football or associate sport professions. Leamington FC chairman Jim Scott, added: “We are delighted to be entering into this partnership with Moreton Morrell College and the wider Warwickshire College Group in setting up the Leamington FC Academy. “It has been our aim for some time to partner with a first-class education provider and with the college being local to us and within the local community it is an ideal fit. “It’s bringing together a complete education package together with the opportunity for local youngsters to hone their football skills and provide a pathway that will hopefully one day see some of them playing at a high standard of non-league football with the Brakes. On Friday August 31, Moreton Morrell College will be hosting pre-season training and trials between 1.30pm and 4pm. There are still a few place left on the BTEC Level 3 Extended Diploma in Sport (Football Academy) and you can apply online. For more information about the about the elite academy go to www.wcg.ac.uk/ or call 03004 560049.